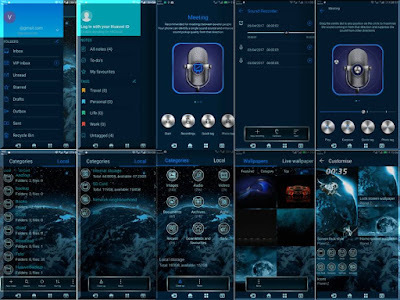 Another heavily modified EMUI 5 theme with dark blue image backgrounds. Its comes with new animations for lockscreen and custom designed icons for clock, flashlight , calculator, recorder . This theme is totally different from those simple material based flat colors . You should try it . Most of the system apps are themed . You may face some unusual graphics glitch here and there because of DPI of screen size . Its a full HD theme which is tested on Huawei mate 9 by the author of this theme. You can download this theme for your huawei EMUI device running on Nougat Based EMUI 5 and then apply it from the Theme app. Instructions are given in the end of this post so that you can understand how to apply these EMUI themes.